As much as I love to cook, I’m often stymied when asked to bring a dish to a pot luck. Everyone wants to bring the big bowl of magic that is empty by the end, where everyone asks for the recipe. But a lot of times, pot luck dishes are just not how I normally cook. Meatballs in a crock pot. Cans of “cream of XYZ” soup in a casserole. Yeah, not so much. I actually discovered this recipe in just this way. At a potluck. The crunch of the peanuts and sweetness of the apples and pineapple is what really made it for me. But I have a childhood fondness for sweetened mayo as a dressing on any kind of fruit. I’m sure there’s a recipe for THAT in the Joy of Cooking somewhere. This is an inexpensive and easy slaw that is great at pot lucks, and is the perfect cool summer salad on hot hot days. Note that the onions in this are optional. The woman who originally made this was allergic to them, and she is the SECOND woman I know who is allergic to onions. Who knew? As I’m not a fan of raw onions, I leave them off. 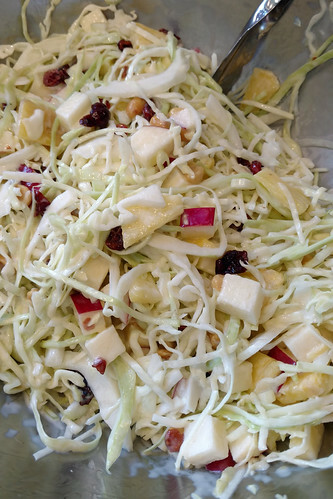 In large bowl, combine cabbage, apple, pineapple, celery and peanuts. Mix dressing. Toss to combine and chill before serving. Miles Away Farm Blog © 2017, where we’re at the height of market season, and don’t have nearly the time to cook that we wish we had! I would never have considered putting peanuts in slaw, but it sounds kind of good! Going to have to try it! This looks wonderful! My husband is a sucker for fruit in slaw, so I’m planning to try this.